Japan’s rapid rise to economic super-power status has led to a worldwide interest in and attempts to emulate Japanese management practices. 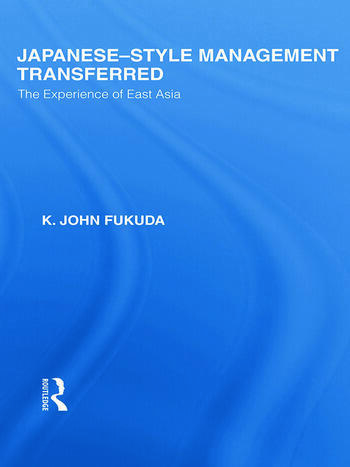 This book, based on extensive original research, considers both the opportunities and problems of the transfer of Japanese management practices to other areas in East Asia. It remains one of the few books of its kind, as other books on Japanese management have concentrated on its transferability to the West. Because many Japanese subsidiaries have been established longer in East Asia than elsewhere and the local work forces have become accustomed to Japanese management practices when transferred elsewhere have become apparent in a way they have not where Japanese management practices are much newer. 1. Introduction: Japanese Management – the Past, Present and Future 2. Comparative Management: What are the Issues? 3. The Models of Japanese Management: How Distinctive are They? 4. The Influence of Culture on Management: How significant is it? 5. Management Practices in East Asian Cultural Settings: Are they all the Same? 6. Japanese-Style Management: How much is it Practiced Abroad? 7. Chinese Workers Under Japanese Management: Are they Happy? 8. Conclusion: Is Japanese –Style Management Transferable? Appendix: Chinese Management: Whatever Happened to its Traditions?